March 10, 2015, 2:49 p.m.
By Philip M. Napoli March 10, 2015, 2:49 p.m. The Pew Research Center recently issued an impressively detailed analysis of the local news ecosystems in three U.S. communities of different sizes and demographic characteristics (Denver, Colorado; Macon, Georgia; and Sioux City, Iowa). This research is the latest, and perhaps most sophisticated, effort to try to improve our understanding of the changing dynamics surrounding the production, dissemination, and consumption of news at the local level. The report contains a number of interesting findings, detailing important differences in how journalism is produced and distributed across different types of communities. Not surprisingly, these communities differ dramatically in terms of the number of news sources available (ranging from almost 150 in Denver to 24 in Macon). The three communities also differ substantially in terms of the extent to which digital news sources have gained a foothold; as well as in terms of the availability of news sources targeting minority communities. In New Jersey, we are working on some related research, as part of the News Measures Research Project supported by the Geraldine R. Dodge Foundation and the Democracy Fund. We have been examining three local New Jersey communities of different sizes and demographic characteristics (Newark, New Brunswick, and Morristown) in an effort to develop useful indicators of the “health” of local journalism ecosystems. Some of the findings in the Pew study jumped out as particularly relevant to the particular context of New Jersey. For instance, the Pew study reports that, regardless of how the web and social media have become an increasingly integral part of local news ecosystems, it’s still local television news that residents rely upon the most. As the authors of the study note: “Local TV, with multiple channels and news programs throughout the day, has the broadest reach in each city,” one that far exceeds all other new sources. 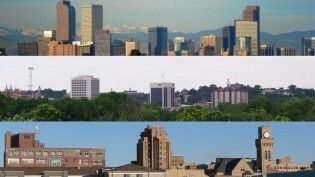 In fact, in each of the three communities studied, local TV news is relied upon by nearly twice as many residents as the second most important news source (daily newspapers in the case of Denver and Sioux City, other local residents in the case of Macon). Why is this finding particularly important for New Jersey? Because, for a state of nearly nine million residents, New Jersey barely has any local television stations. Most of the local television stations that New Jersey residents receive — particularly those that produce news — originate from across the border in either New York City or Philadelphia. The only city in New Jersey that has a small cluster of local TV stations to call its own is Atlantic City. For the rest of New Jersey, local TV news means news originating from New York or Philadelphia, or from a statewide cable news network such as News 12 New Jersey. And while these sources do provide some coverage of New Jersey, the bottom line is that for stations located outside of the state, any coverage of New Jersey will be dictated at least in part by whether the stories are also of interest to residents of New York or Philadelphia. It would be interesting to see if a survey of New Jersey residents indicates levels of reliance on local TV for news that are as high as those found in the surveys of the three communities conducted by Pew. One would hope not, for to rely on local TV news in New Jersey is to rely on news that, for the most part, isn’t really local at all. But odds are that we would find similar levels of reliance on “local” television for news in New Jersey. Research tells us that that all forms of media content — including news — tend to flow from large markets to small markets and that the bigger-budget content produced in larger markets can divert audiences’ attention from the smaller-budget content produced within and for their local communities. The effect of that diversion of audience attention to non-local sources is damaging both economically and politically. Economically because true local news sources have to share audience attention — and thus advertising dollars — with larger, out-of-market news sources, making it more difficult for them to remain viable. And politically because these kinds of shortfalls in the provision and consumption of local news can undermine informed political participation and community engagement. Given these dynamics, perhaps it is not surprising that in our ongoing research on the health of local news ecosystems in those three New Jersey communities, Newark — a relatively large city with over a quarter of a million residents, located just across the river from New York City — appears to be dramatically underserved by local news sources when compared to the other two communities, both of which are further outside the orbit of New York. Specifically, when we examined the number of sources of local journalism in each of the three communities, Morristown had 11 times more local journalism sources per 10,000 residents than Newark; New Brunswick had almost four times more sources per 10,000 residents than Newark. There may be a range of other possible explanations for these patterns that extend beyond the issue of proximity to a large, out-of-state media market. Indeed, the variety of pronounced differences found between the three communities studied in the Pew report, and the pronounced differences found between the three New Jersey communities studied in our research, point to the fact that local journalism ecosystems may be impacted by a range of factors. To truly understand the complex relationships between the characteristics of local communities and the characteristics of local journalism ecosystems, we need to figure out a way to expand beyond the kinds of focused analyses on a limited number of communities that we have been conducting thus far. By figuring out a way to scale this kind of research so that we can analyze 100, or even 200, communities, we can gain a broader, more generalizable sense of what makes for healthy — and unhealthy — local journalism ecosystems in this country, and what this health — or lack thereof — means for how well these communities function. We’ll be talking about these and related issues at our April 10 conference, Quality Journalism in the Digital Age. We welcome everyone to come to Rutgers and join the conversation. Philip M. Napoli is a professor of journalism and media studies at Rutgers University. 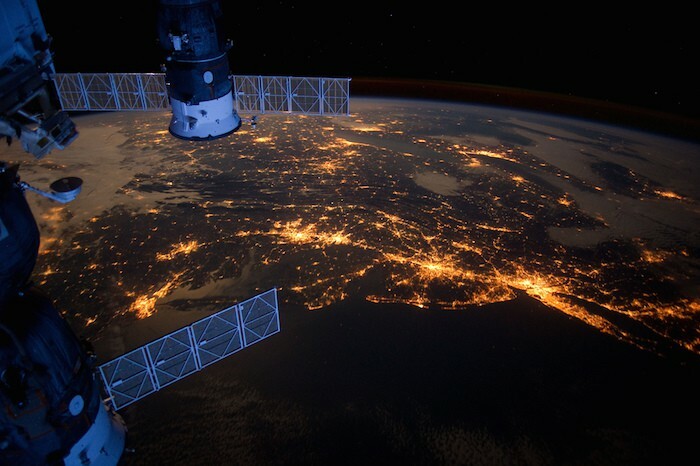 Photo of New Jersey from space by NASA. POSTED March 10, 2015, 2:49 p.m.
Napoli, Philip M.. "When local news isn’t really local: In New Jersey, New York’s shadow can mean a less healthy news ecosystem." Nieman Journalism Lab. Nieman Foundation for Journalism at Harvard, 10 Mar. 2015. Web. 19 Apr. 2019. Napoli, Philip M.. "When local news isn’t really local: In New Jersey, New York’s shadow can mean a less healthy news ecosystem." Nieman Journalism Lab. Last modified March 10, 2015. Accessed April 19, 2019. https://www.niemanlab.org/2015/03/when-local-news-isnt-really-local-in-new-jersey-new-yorks-shadow-can-mean-a-less-healthy-news-ecosystem/.